Categories What are an epilation and depilation? Epilation and Depilation or how to find a way in the jungles of beauty? Hair contains melanin pigment which can absorb and conduct the light. This is the base of the photo epilation. Absorbing the energy of a light impulse, melanin provokes heating and destruction of a hair follicle. As a result, hair leaves the treated area. What’s more, each flash of light kills several follicles at once. There’s a nice side effect: due to collagen producing stimulation, the skin rejuvenates. Photo-epilation can affect the body perspiration: sometimes the respiratory glands are damaged along with hair follicles. Time: one procedure lasts from 10 min to 1 hour. The time between procedures is 2 to 8 weeks. Result: I’d be frank, one procedure won’t kill hair once and for all, as they grow in turn. The ones that are visible are 30% of all hair in its active phase of growing. That’s what will be removed in one procedure. They won’t appear again (if the procedure is done professionally). Then the next portion of hair grows, the next 30%, and so on. 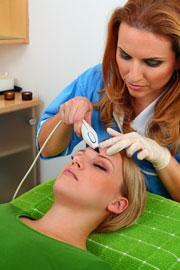 Estheticians claim that the desired effect can be achieved in 3-7 procedures. But after the very first procedure, you will already notice that the hair started falling out, and the new portions of it appearing are weaker and thinner. Nevertheless, as practice shows, despite all ads’ claims, the photo epilation is not a panacea. Notes: you shouldn’t sunbathe 3 - 4 weeks before the procedure and ten days after. It’s very similar to the photo epilation, but the hair follicles are being destroyed by a laser. The laser has a certain light wavelength. For example, the wavelength of a ruby laser reaches 694 nm, an alexandrite one produces 755 nm waves, a diode laser - 800 nm, a neodymium laser - 1064 nm. Thus the laser sends a wave of a certain length, say, 755 nm, while the equipment for the photo epilation IPL (Intensive Pulse Light) forms a light beam with a wide wave range (500-1200 nm), treating the bigger area. But the light beam is weaker than the laser one. Advantages: the same as the photo epilation has, but it also destroys lanugo, gray, blond and red hair as it doesn’t depend on the melanin. 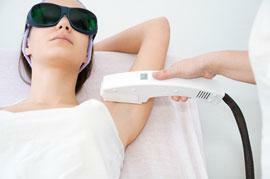 Disadvantages: the laser epilation cannot be done on the tanned skin (the diode laser is an exception). Dark skin or recently tanned skin. Time: the same as the photo epilation. After the laser epilation, you might see a false hair growing, but it’s only dead roots that are surfacing. They are easily removed with tweezers. Electric current is applied to a very fine needle-shaped electrode, or metal probe into each hair follicle to destroy the root. The needle-shaped electrode can be made of medical alloy: an isolated one, with a Teflon coating for people with low pain tolerance; golden one – for people with allergies). There are several methods of Electrolysis: Electrolysis itself, thermolysis, blend-method, flash-method, sequential blend. But I won’t continue naming them not to overload you with information. It’s a relatedly cheap procedure. After the procedure, a local redness and swelling may develop which disappear after a couple of hours usually; also red dots can appear on the skin that turns into the scab and soon disappear. Time: from 15 mins to 1 hour per procedure. Result: from 5 to 10 sessions to remove the maximal amount of unwanted hair. During a week after the procedure, we do not recommend using sauna and pool. The first stage of this procedure is sugaring/waxing. During the second stage, a special gel is applied, and then the skin is treated with an ultrasound. As a result, molecules and ions of the gel penetrate the skin deeply. If hair follicles are in its active growth phase, they will be destroyed. If the hair follicle is in quiescence, the growth of a hair slows down. The relatively low cost was comparing to other types of epilation. Is not recommended for the bikini area. Time: the procedure lasts from 10 to 30 minutes. Result: first procedure destroys hair in the active phase of growth. 6-10 sessions (with a month between the procedures) allow getting rid of 70 - 90% of unwanted hair. We do not recommend sunbathing after the procedure. The first stage of this procedure is sugaring /waxing. During the second stage, the designated area is treated with the enzyme-containing mixture. Then the skin is covered with special thermo-bandage and treated by infra-red rays. As a result ferments from the mixture penetrate hair follicles and destroy them, interfering with the metabolism in the area of hair growth, and killing hair follicles. After infra-red ray treatment, the practitioner removes the bandage and treat the area with enzyme-containing lotion. It soothes skin and, what’s the most important, slows down the hair growth. * Enzymes or ferments (trypsin, papain) are bioactive substances that are very effective, safe for your body and are used for the cosmetic purpose to remove unwanted hair. Makes newly growing hair thinner and weaker. The procedure should be repeated every month. Time: the length of the procedure is 40-50 mins. Result: after the first procedure the newly growing hair becomes weaker and thinner. The desired effect takes from 4 to 7 procedures. Use depilation creams to remove newly growing hair to avoid the ingrowing. The practitioner applies sugar paste that looks like transparent clay (it is usually made of sugar or fructose) and with a quick move tear the hair stuck to the paste off, along with the hair growth. Then a soothing lotion is applied. Sugaring also has an exfoliation effect leaving skin smooth and silky. Redness that usually disappears in several minutes. Time: the procedure takes from 30 mins to 1 hour. Result: smooth skin for 10-25 days. We recommend repeating the procedure every 40 days. After a couple of years of regular sugaring, unwanted hair stops growing. Notes: Do not remove hair for 2-3 weeks before the procedure, so their length is not less than 1/8"-/4". Wax is warmed up and applied to the growth of hair over the designated area. On top of it, a textile or paper strip is applied. When the wax cools down, the strip with wax and hair is removed by a quick jerk. For those who are afraid of burns, there’s a procedure of cold waxing. But it’s more painful. Can be done on any body part. Redness (usually disappears in a couple of hours). Time: the procedure usually takes from 30 mins to 1 hour. Result: smooth skin for 10-20 days. We recommend repeating the procedure every 40 days. After a couple of years of regular waxing, unwanted hair stops growing. Do not remove hair for 2-3 weeks before the procedure so their length is not less than 1/8"-1/4". Before and after the procedure a special disinfectant should be applied on the skin. To avoid irritation, a special soothing lotion should be used. 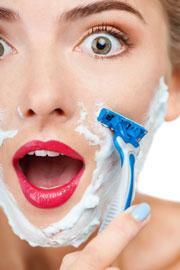 It’s the simplest and the most popular method of removing unwanted hair in the world. Shaving is done with the help of a razor. Removes hair of any length. The effect doesn’t last long. Contraindications: Pus and inflammatory skin diseases. Result: As I mentioned above, it’s a very short-term one. Hair continues to grow, and new ones appear above skin in 1-2 days after shaving. Notes: Treat your skin with moisturizing lotion after you shaved. Special depilation creams destroy the protein based structure of hair. The cream is applied on the designated area, then using a pallet or a sponge it’s removed from the skin together with unwanted hair. After the procedure, the soothing lotion is applied. Suitable for very sensitive skin areas like bikini zone. Disadvantages: Very short term effect. Time: the procedure takes 30 mins in average. Result: you will get the smooth skin for 1-5 days depending on personal characteristics. Notes: Before using a depilation cream you need to test it on a small area to avoid chemical skin burns. It’s a mechanical hair removal with the help of special tweezers or electro-depilator that grabs hairs and pulls them out. Result: lasts for 10-15 days. We recommend repeating the procedure once a week. If you do it regularly, hair becomes softer and thinner with time. Notes: After the procedure, a soothing lotion should be applied.